The essay is entitled A Visible Witness; what struck me about it particularly were her anecdotes of personal reactions to the habit. She writes that it was seeing nuns wearing habits when she was a little girl that spoke to her of this “alternative” lifestyle, if I can use that phrase! I found her accounts of the positive responses of ordinary people to her when they see the habit especially charming. For ease of reading, I have removed the footnotes and references from the original essay. The photograph below is taken from the community’s website. 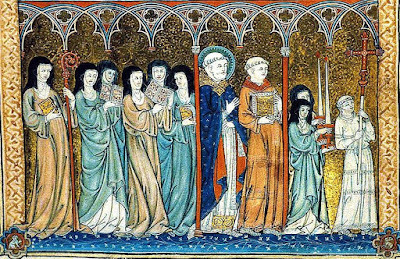 Early in the Church, those who dedicated their lives to God wore some form of identifiable clothing that distinguished them from the world. The purpose was to visibly set them apart from the world for God’s service. Through the centuries this type of clothing, namely the religious habit, has taken many shapes and forms in the diverse communities that God has called into being. During the past sixty years, the value, relevance, and need of the habit has been disputed. However, many young people with vocations to religious life are being drawn to communities that do wear the habit. It is my opinion that in our world today, this visible witness of the religious habit is still needed to silently but eloquently proclaim the reality, presence, and primacy of God. One of the first references of any sort of garb for those who gave their lives to God is in the writings of St Pachomius, who founded the cenobitic way of life in the fourth century. 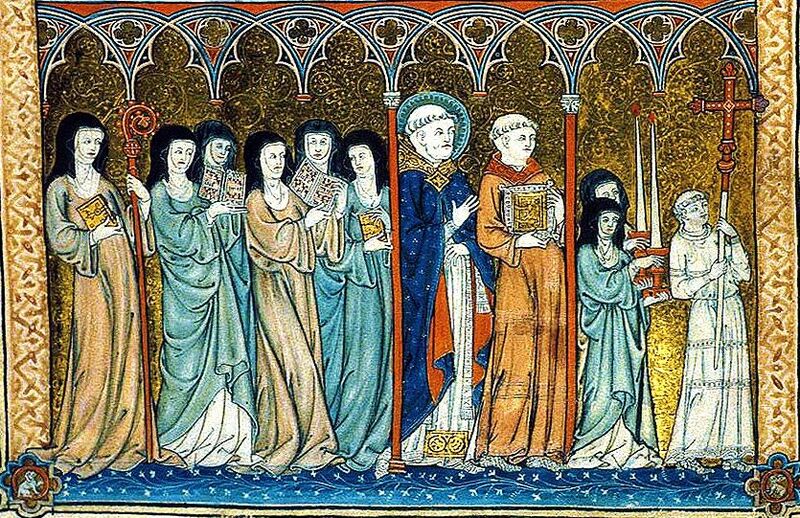 In his Rule, he requires all those who pass the initial tests for entrance into the monastery to be stripped of their secular clothing and be clothed in the monastic habit. St Benedict and St John Cassian also prescribe the clothing in the habit in their Rules. St Augustine also refers to a plain and simple habit for both men and women religious. This new and different clothing was a symbol of renunciation of the world, and the simplicity and poverty of religious life. No monk was to have anything different than another so that there could be no cause for contention over material things. For women, the veil was also given as a special sign of consecration to Christ, their Divine Bridegroom. Since the time of St. Ambrose, there has been a special ceremony of conferring a veil on a virgin. The veil is also a public symbol of the nuptial union of Christ and His Church. The religious habit was valued as the strong visible witness of a life given to God, and so continued as part of religious life. Religious habits remained simple, often in black, to signify the death to the world and to self that the religious life entails. 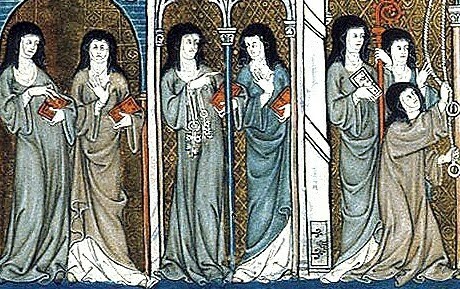 Various parts of the habit, such as the scapular, were added as time went on, but the essentials of the tunic, belt, and veil, for women, remained consistent. St Benedict in his Rule refers to the scapular as being a garment worn for work. The scapular is a garment made of two long pieces of fabric, roughly the width of the person and the length of their height, joined together at the shoulders so that one piece falls in front and one in the back of the person. It was originally used as an apron, protecting the tunic while working. St Simon Stock and St Dominic were both given the scapular directly from Our Lady to become a regular part of the habit of their respective orders. At the end of the twelfth century, St Dominic saw a vision in which Mary held a scapular which was to be part of the Dominican habit. Around the same time, St Simon Stock received the Brown Scapular as a pledge of salvation for all who wear it and it has become a sign of Her protection of the soul. The scapular, as well as each part of the religious habit, took on a special meaning as the privilege of wearing the habit was better understood. As different orders started in response to God’s call, each one assumed a distinctive habit that would distinguish the different orders from one another. 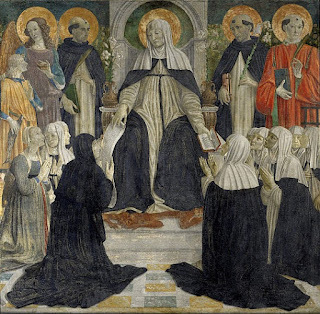 Benedictines were known by their black habits, Dominicans wore white tunics and scapulars symbolizing purity, and Franciscans were recognized by their brown or gray robes for poverty. 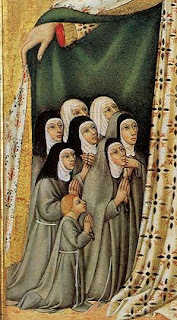 For women, the black veil was often a sign of profession, succeeding the white veil of a novice, usually worn over a white wimple which covered the head and neck of the sister. As more orders of sisters were founded, many interesting and distinctive forms of the habit, especially the veil, came into use. The front of the veil could be rounded or square, fit closely over the face, or widely fall over the shoulders. There were veils that had frills around the face, a box-like shape, or even a starched bow under the chin. Different colors were sometimes used, such as blue in honor of Our Lady. While retaining the essence of a garb set apart for God, each different community could be known by the sister’s particular habit. In the 1950s, it was recognized that some of the parts of the religious habit, especially for women, had become overly complicated or impractical. Some communities used many yards of material in the tunic alone. The amount of material made it hard to wash frequently and expensive to make. Another example is the veils which came so far around the face that it eliminated the sisters’ peripheral vision. For sisters learning to drive a car, this would be dangerous. Pope Pius XII in 1951 commented on the need for a modification of the habit to suit the present needs. Shortly after the Second Vatican Council, the topic of modifying the habit again was addressed and communities, in obedience to the Church, considered revising this aspect of their religious life. With all the other social issues going on in America, such as the radical feminist movement and concern for social justice, it seems that many American sisters interpreted the call for modification as permission to cease wearing the habit altogether. From my perspective, they thought in goodwill that for the sake of “equality” and “the liberation of women”, sisters now were not forced to wear such restrictive clothes that were remnants from unenlightened and past times. In some communities, this erroneous interpretation was held by sisters in authoritative positions, and so entire communities were deprived of the habit. This was not the case for all communities. Many did follow what the Church truly desired in simply modifying their habit in such a way that it retained its character as a clear, visible witness of Christ. In addition to these faithful communities, many new communities who wear the habit were started in America. The growing communities of sisters are those who do wear the habit because young women who hear the call to religious life recognize the need for it more than ever in our world today. In the past 60 years, the Church has given much instruction on religious life, including the topic of the religious habit and its value. In the Code of Canon Law, it states that “Religious are to wear the habit of the institute, made according to the norm of proper law, as a sign of their consecration and as a witness of poverty” (669, §1). Pope St John Paul II explains the reason for this in his apostolic exhortation Vita Consecrata. “The Church must always seek to make her presence visible in everyday life, especially in contemporary culture, which is often very secularized and yet sensitive to the language of signs. In this regard, the Church has a right to expect a significant contribution from consecrated persons, called as they are in every situation to bear clear witness that they belong to Christ. Since the habit is a sign of consecration, poverty, and membership in a particular Religious family, I join the Fathers of the Synod in strongly recommending to men and women religious that they wear their proper habit, suitably adapted to the conditions of time and place” (25). Other Church documents, including the Decree Perfectae Caritatis, reference the necessity of the habit and how it should be modified according to current needs. The Church recognizes and articulates that the habit is important. It provides the visible witness that Christ is first in our lives and that a religious strives to live completely in that reality. Wearing the habit exclusively declares that the religious do not worry about material things, and relies on God for all temporal needs. The simplicity and poverty of the religious life is manifested by having only one thing to wear, for everyday work as well as the most formal occasions. Even if a community’s habit needs to be modified for practical reasons or for the particular apostolate, it is still to be a clear sign of consecration to all, including the religious herself. The habit bears witness both to the reality of God, and that we are to be living and working solely for Him. The habit is very connected to my vocation to the religious life. In the diocese of Santa Rosa where I grew up, there were a few sisters from three different communities ministering in the schools and the hospital. However, if I had not been told, I would not have known they were sisters because they did not wear a recognizable garb other than professional-looking clothes, a lapel pin, or cross necklace. Besides the saints who were religious, the other community of sisters I was most familiar with was the Poor Clares of Perpetual Adoration on EWTN. Wearing the full habit, they were an unmistakable witness of religious life. At age six or seven, I thought I was going to be a nun, which in my mind meant going to Alabama to that community. My sister and I would play that we were nuns and always wore fabric on our heads for a veil since we knew that was part of being a nun. Even at that young age, I had an intuitive sense that being a sister involved wearing a habit. The thought never even crossed my mind to be like the sisters in my diocese, since I just thought they were a different kind of sister and not the kind that I would want to join. After high school, when I was seriously discerning the religious life, the habit was a necessary component of any community I considered. If God was calling me to be a sister, I desired to look like one. The Marian Sisters of Santa Rosa, who had just come to the diocese, wore a beautiful habit of white and blue. There was no question of who they were since their clothes proclaimed that they belonged to God. Since receiving the habit of the Marian Sisters of Santa Rosa, I am so grateful each morning to dress in this habit. The habit provides a freedom that to the world seems like a restriction. I am free from the worry of what to wear if it will be appropriate for the occasion, if the color suits me, or if it is modest enough. It takes much less time to get ready for the day when putting on the habit since there is no deliberation involved. When wearing secular clothes, one outfit is tried on, and then removed to try another, until, after much time and effort, a set of clothes is decided upon. Now, my time is used to beautify my soul for the reception of my Spouse in Holy Communion later that day. To the world, only having one choice might be seen as a lack of creative freedom to express my personality by what I wear. In my experience, never having other options of what to wear frees me from thinking so much about myself to think about the more important things in life. While donning the holy habit, I am praying, asking God for the strength for what I am to face that day, and clothing myself in His grace. Creativity is not suppressed but redirected away from myself to invent new ways of giving glory to God and showing love to Him and those around me. My personality, instead of being stifled by the habit, is revealed even more clearly through my actions and words because my clothes are not a distraction. Wearing the habit, I am free and even expected to pray in public, and to say “God bless you” to everyone because I am what I look like: totally dedicated to God. When any of the sisters walk or go anywhere, we receive attention because of the habit. Some people spontaneously ask for prayers, intuitively trusting in our intercessory power with God. Others will relate stories of being educated by nuns, or share fond memories of an aunt who was a nun. Many comment on the beauty of the habit, happily surprised to see it after thinking it was a thing of the past. These are some of the responses we receive from those who come up to talk to us, but many more see us and are affected by the presence of God apparent in us, even from a distance. To travel to my apostolate, I walk for ten minutes along one of the busiest streets in the city. Hundreds of cars pass me each morning as I pray my Rosary. One day recently, I received the comment, “I saw you on the street corner, and thought how beautiful your outfit, or whatever you wear, is!”. It is not uncommon for a generous soul to anonymously pay for our meal, or grocery purchase, not because they have talked to us, but because they know who we are by the habit. Though we might never interact with those who see us, we pray that we are a channel of grace to bring them closer to God. The habit, while being a sign of God’s Presence in the world, is also a reminder to the religious herself of who she is. In my experience, the habit aids recollection and prayer in times of formal prayer, as well as when going about my duties. The sides of our veil, coming over our shoulders, act as slight blinders to our peripheral vision, directing our focus straight ahead to God. Our habit is long, obliging us to move with care and Mary-like grace. When I am struggling, or need assistance with anything, I find my hand reaching up to clasp Our Lady on my Miraculous Medal. As a professed sister, I wear a ring, reminding me that I am Christ’s Bride before any role or duty I have in the apostolate. I know, whenever I am acting, that I act not as an individual, but as a representative of Christ, His Church, and our community. The respect or attention I receive from others is not for me as an individual, but on account of the habit, it is for Christ, whose bride I am and whom I reflect to the world. The religious habit is the beautiful sign of consecration to God since the early Church. All who see it are reminded that there is a higher purpose in this life than the concerns of this world, that there is some reason, namely the love of God, that religious would dress in this way. The habit declares without words that this person has a strong relationship and intercessory power with God. The value of the witness of the habit is proved by its resurgence in the Church and will continue to be a clear manifestation of God to the world.